Cook sausage and onion in a large skillet over medium-high heat 5 minutes or until meat crumbles. Stir in hash browns, and cook 5 to 7 minutes or until sausage is no longer pink and potatoes are lightly browned. Drain mixture on paper towels; spoon into a greased 13- x 9-inch baking dish. 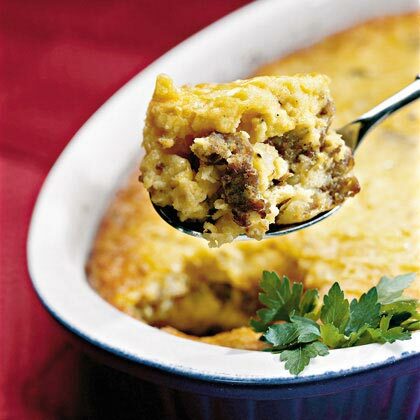 Stir together eggs, cheese, and next 4 ingredients; pour evenly over sausage mixture, stirring well. Cover and chill 8 hours. Bake, covered with nonstick foil, at 350° for 45 minutes. Uncover and bake 10 to 15 more minutes or until a wooden pick inserted in the center comes out clean. Remove from oven, and let stand 5 minutes. Serve with desired toppings. Garnish, if desired.